The Adventure Park at Storrs offers the most zip lines in the gereater Hartford area---but the Park is much more than just zip lines. It's a total climbing experience for young or old. (PRLEAP.COM) The Adventure Park at Storrs, Connecticut, the popular outdoor zip line and climbing venue located at 2007 Storrs Road, is now open for its 2019 season of zip line and climbing fun, starting with its spring schedule. 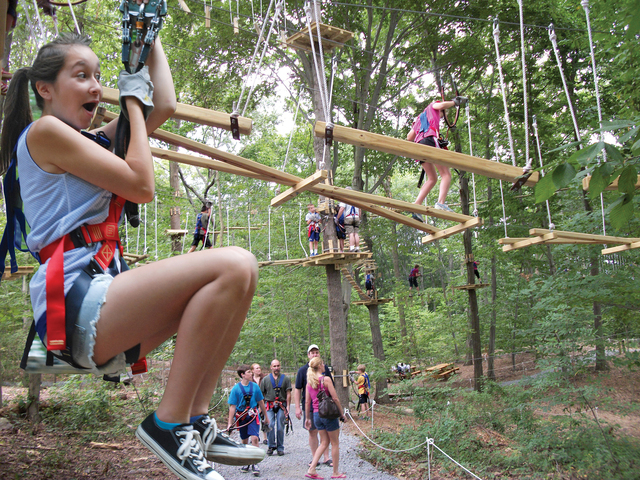 The Adventure Park at Storrs can boast the most zip lines in the entire Hartford, Connecticut region —- 19 zip lines in all, including its new "Pine Rush" aerial trail—- a mostly-zip-lines aerial trail which debuted last season. The other seven trails offer the Park's exciting combination experience of climbing adventure with zip lines. One ticket buys admission to all trails. For further details and updates please visit www.StorrsAdventurePark.com, email Info@StorrsTrees.com or call (860) 946-0606. On Facebook: @StorrsAdventurePark. The Adventure Park at Storrs is designed, built and operated by Outdoor Ventures. For further details and updates please visit www.StorrsAdventurePark.com, email Info@StorrsTrees.com or call (860) 946-0606.